1968 University of Illinois, Urbana, IL; M.F.A. 1966 School of the Art Institute of Chicago, Chicago, IL; B.F.A. Rain Forest: Contemporary Paintings by International Artists, Kaohsiung Museum of Fine Arts, Kaohsiung, Taiwan; Taipei Gallery, New York, NY; Las Vegas Art Museum, Las Vegas, NV; Foreword: Tchen, Yu-chiou, 2001. 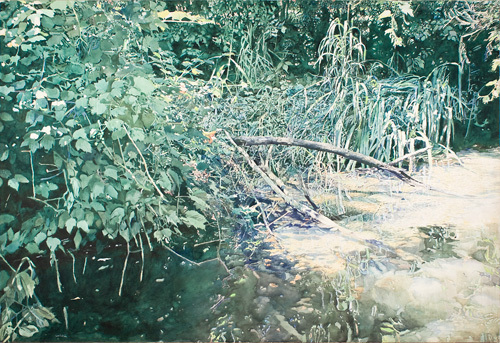 Green Woods & Crystal Waters: The American Landscape Tradition, Philbrook Museum of Art, Tulsa, OK; John Arthur, 1999. The Artist and the American Landscape, Text: John Driscoll, Picture Editor: Arnold Skolnick, First Glance Books, Cobb, CA, 1998. Curator’s Statement: Harold Gregor, 1992. Spirit of Place: Contemporary Landscape Painting and The American Tradition, John Arthur, 1989. Introduction: John N. Colt, 1988. Mainstream America: The Collection of Phil Desind, The Butler Institute of American Art, Youngstown, OH; Introduction: Louis Zona, 1987. American Realism: Twentieth-Century Drawings and Watercolors from the Glenn C. Janss Collection, San Francisco Museum of Modern Art; Text: Alvin Martin; San Francisco Museum of Modern Art/Harry N. Abrams Publishers, New York, 1985. Contemporary American Realism Since 1960, Frank Goodyear, Pennsylvania Academy of Fine Arts, Philadelphia, PA, 1981. An American Flower Show, J. Frederick Cain, Heritage Plantation, Sandwich, MA, 1980. Watercolors 1980, Frumkin & Struve Gallery, Chicago, IL; 1980. Arts Magazine, “William A. Nichols”, Catherine Lamagna, September 1979. Art International, “Reviews”, Carter Ratcliff, May/June 1977. The Capital Times, (Madison, WI), “This art’s for real, and easy for the eye”, Kevin Lynch, April 28, 1994. Detroit News, “New Realism wins with it’s eye appeal”, Joy Halkanson Colby, December 23, 1984, p.4E. Art/World, “SoHo and The Realist Revolution”, Nike Hale, May/June 18, 1979. SoHo Weekly News, “Reviews”, John Perreault, September 25, 1975.